The Village Grande at Camelot is an active adult community by D.R. Horton. It is conveniently situated in the beautiful Gloucester County countryside off of Route 55 in Glassboro, New Jersey. This community offers luxury living custom made for active adults. Single-family homes with many standard upgrades and customization options make this 55 and over community appealing to discerning buyers. A magnificent clubhouse provides all the amenities of a luxury resort. Situated not far from Glassboro nature parks, Philadelphia, and Atlantic City, residents will find plenty of off-site activities in addition to the on-site amenities. The 18,000 square-foot clubhouse, named the Club Grande, offers a distinct lineup of amenities. Large gatherings and scheduled events take place in the fabulous multi-purpose room, while arts and crafts room and card rooms cater to individual hobbyists who like to come together over common interests. The friendly feeling continues to the lounge, library, and billiards table, where rest and relaxation takes priority. For more active times, residents of The Village Grande at Camelot can utilize the exercise room to stay fit and healthy. Outside, a refreshing outdoor pool and patio is a great way to cool off after activities, or simply to enjoy the New Jersey summers. Bocce ball courts are available for some friendly competition, while residents who enjoy a nice early mornings stroll, The Village Grande at Camelot offers walking and biking trails, a gazebo, and scenic ponds. The Village Grande at Camelot offers single-family homes in seven different floor plans, ranging from 1,299 to 2,261 square feet in size, with two bedrooms, two or two-and-a-half bathrooms and an attached two-car garage. Homes feature first-floor master bedrooms. Kitchens include separate breakfast rooms, garbage disposals, and pantry closets. Bathrooms feature ceramic tile flooring, awning windows in master baths, and linen closets. Some of the customizing designs are screened-in porches, all-season sunrooms, security systems, intercom systems, concrete patios, whirlpool tubs, and home automation packages. D.R. Horton started construction of this 55 and over community in 2008 and is scheduled to have 450 planned homes upon completion. Residences are available new or on a resale basis. The monthly association fee includes common area and lawn maintenance as well as snow removal. The many on-site amenities of The Village Grande at Camelot and a full-time activities director provide residents with a physically and socially active lifestyle. Residents also have their own website and access to a variety of clubs and interest groups. Some of the clubs and groups include board games, breakfast club, dinner group, line dancing, bocce, bowling, softball, golf, swimming, walking, bridge, poker, and more. Off-site, residents can enjoy a variety of parks and wildlife-oriented recreation in the Glassboro area. The Village Grande at Camelot is located in Glassboro, New Jersey. While nature lovers are sure to enjoy Glassboro, the area offers other attractions as well. Some places worth visiting are the South Jersey Museum of American History, the Heritage Glass Museum, the Broadway Theatre of Pitman, and the Music Museum. The Village Grande at Camelot is only half an hour away from Philadelphia, which offers world-class shopping and dining, as well as easy access to its international airport. Some of the popular attractions in Philadelphia are the Old City Arts District, the Civil War Library and Museum, and the Rosenbach Museum and Library. An hour away from The Village Grande at Camelot residents can visit a large variety of New Jersey Shore communities. Atlantic City is also in close proximity and provides top entertainment, designer specialty stores, world-class restaurants, and gorgeous beaches. 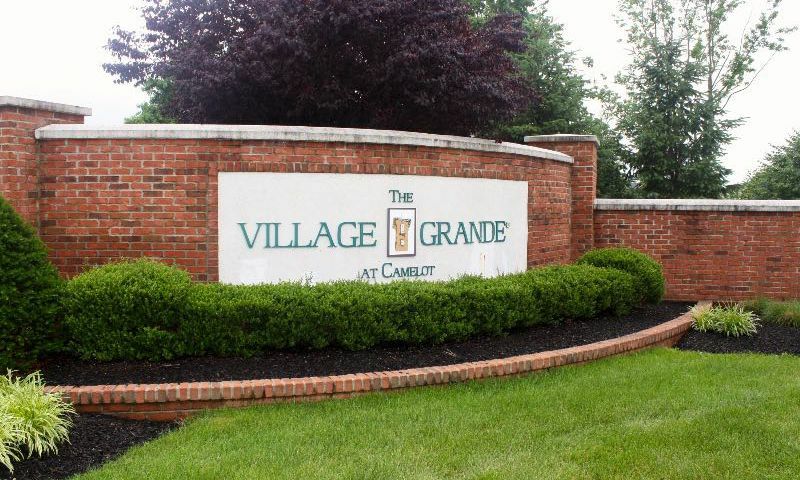 With so much to do in and around this beautiful active adult community in Glassboro, New Jersey, it's easy to see why those 55 and better love calling The Village Grande at Camelot home. Club Grande - 18,000 Sq. Ft. There are plenty of activities available in The Village Grande at Camelot. Here is a sample of some of the clubs, activities and classes offered here. The Village Grande at Camelot offers single-family homes ranging from 1,299 to 2,261 square feet with two bedrooms, two or two-and-a-half bathrooms, and an attached two-car garage. Homes feature first-floor master bedrooms. Kitchens include separate breakfast rooms, garbage disposals, and pantry closets. Bathrooms feature ceramic tile flooring, awning windows in master baths, and linen closets. Some of the customizing designs available at The Village Grande at Camelot are screened porches, all-season sunrooms, security systems, intercom systems, concrete patios, whirlpool tubs, and home automation packages. D.R. Horton started construction of this 55 and over community in 2006 and is scheduled to continue until all 450 planned homes are completed. Residences are available on a new or resale basis. We bought a new construction home here a couple years ago. The process was pretty seamless and we are happy. Looking back there are some things we wish we would have done differently but oh well. We like the neighborhood and the people here are friendly. Prices are reasonable and you get a lot for what you pay. 55places.com is not affiliated with the developer(s) or homeowners association of The Village Grande at Camelot. The information you submit is distributed to a 55places.com Partner Agent, who is a licensed real estate agent. The information regarding The Village Grande at Camelot has not been verified or approved by the developer or homeowners association. Please verify all information prior to purchasing. 55places.com is not responsible for any errors regarding the information displayed on this website.